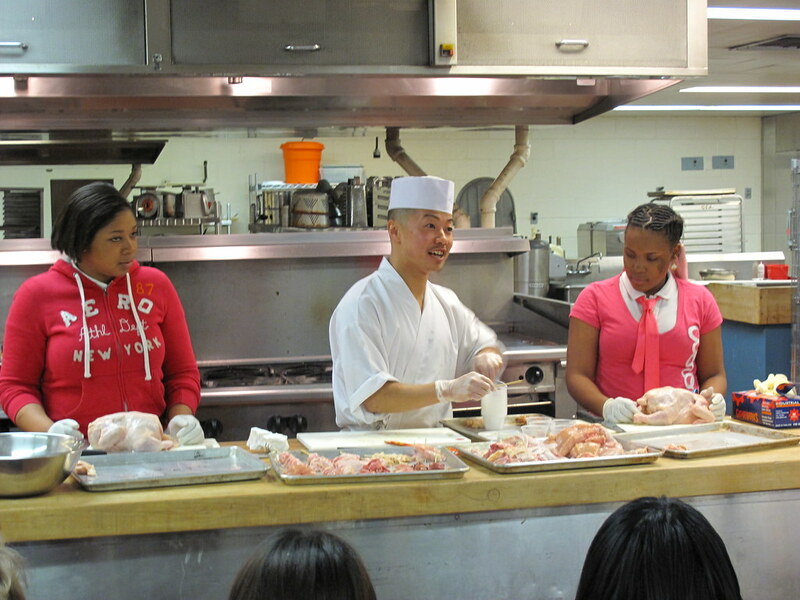 On March 1, 2012, under the auspices of the Gohan Society, Chef Atsushi Kono of NYC’s famed yakitori restaurant, Tori Shin, conducted a lecture demonstration before 30 students of the High School of Food and Finance, the only NYC public high school to teach culinary arts to all students. Five students each from six classes were specifically chosen to participate in the special class, held in the school’s teaching kitchen. They were chosen for their academic and culinary skills, commitment to their studies, and excellence in attendance and attitude. The students were led by instructing chef Dinella Ascenso-Ayala, known to all as ‘Chef Dee’. Chef Kono gave a brief description of his culinary education and career and discussed the place of yakitori in the pantheon of Japanese cuisine. He also talked about key elements of yakitori – the quality of ingredients, the fire, the charcoal, the skewers, and the tare – the unique sauce that is brushed on the food in the final stages of cooking. The Chef’s began the demonstration by showing how he cuts a whole chicken, rendering the maximum yield for yakitori. Two fearless students then joined the demonstration, displaying their knife skills and taking direction from Chef Kono. As the lesson progressed, every student was presented with the opportunity to engage in every aspect of preparing yakitori. Students gathered to cut chicken into specific parts, yielding the numerous varieties of menu items found in a yakitori menu. They skewered like items together and worked the konro, a Japanese grill, burning binchotan, the Japanese low-smoke, high-heat charcoal. Students at the konro were guided by Chef Kono’s able assistant, Chef Suzuki. Throughout the 90 minute session students were fully engaged in the process of learning yakitori. Although the demonstration took place over two class periods, a number of students stayed through their lunch period to continue cutting, skewering and grilling. Although students at the High School of Food and Finance are actively studying culinary arts each and every school day, for many students, this was their first hands-on experience cooking Japanese food. Chef Kono, the HSFF administrators and teachers, and the students, especially, were unanimous in their praise and appreciation of this unique learning experience.